This tour finishes at approximately 7:00pm in Victoria or Kensington (Gloucester Road).. Spend a day in the rural Cotswolds region of England during this guided day tour. You’ll leave fast-paced central London and head to this relaxed and scenic part of the country. Enjoy a guided visit of Blenheim Palace and spend some time in the pretty village of Burton-on-the-Water. Your day begins with a panoramic tour of the Cotswolds, where you’ll spy sleepy market towns in the middle of rolling hills and green fields. 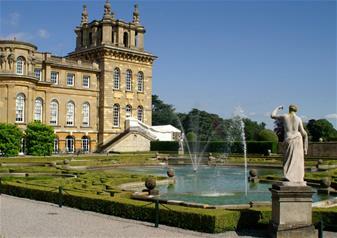 After your Cotswolds panoramic tour, you’ll arrive at Blenheim Palace for a guided tour. Early arrival at the Palace ensures an almost private visit of this gorgeous mansion! You’ll visit the State Rooms to view the breath-taking paintings and priceless treasures and take a walk through the Capability Brown designed landscaped gardens. Blenheim Palace is one of England’s largest houses and a treasured countryside retreat. Built between 1705 and 1722, Blenheim Palace is owned by the Duke and Duchess of Marlborough and has been open to the public since 1972. This architectural beauty is set in over 2,000 acres of lush parkland and is the only non-royal country house in England to hold the title of palace! See the gorgeous sights of two of the Cotswolds’ most beautiful villages – Burford and Stow on the Wold. Have your cameras at the ready as you drive through the picturesque landscapes and soak in the gorgeous sights. Once the tour has finished in Stow on the Wold, you will be taken back to London. This tour finishes at approximately 7:00pm in Victoria or Kensington (Gloucester Road)..